Thanksgiving is just around the corner, which means the holiday shopping season is only a few short weeks from entering full swing. To help kick-off the season, American Express is sponsoring another Small Business Saturday, on November 30th– the Saturday after Thanksgiving. If you’re a bricks-and-mortar small business, or an online small business, now is the time to register to participate. 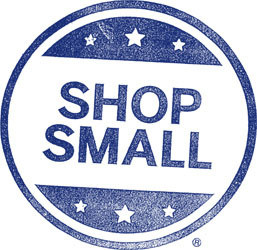 American Express founded Small Business Saturday in 2010, and has been sponsoring the event every year since. It is designed to encourage consumers to support their local small businesses, and to help those small businesses promote themselves in their communities. American Express Cardholders can register, starting on November 24, 2013, to get a $10 statement credit when they spend $10 or more at a participating small business on November 30. An Online Tool you can use to create Small Business Saturday marketing materials customized for your business. Use the tool, and then submit the application to receive your customized materials via Email. Download Small Business Saturday Logos and Signs. Download Email and Social Media Templates to help you promote participation. Order a Free Shop Small doormat and 20 Free Shop Small shopping bags. You can learn more about the event by watching the Small Business Saturday video on the website. The site also provides tips for promoting your business during the event, as well as a number of videos describing success stories from last year’s Small Business Saturday. Only small business located in the United States with fewer than 25 locations, and online businesses with a US service area, that have annual revenue under $10 million are eligible to participate. Franchises, non-profits, religious organizations, and some other business types are not eligible. Read the full terms here. If your small business qualifies, take some time to learn more and register for Small Business Saturday today. Not only will you get to take advantage of the American Express machine to help promote your business, but you will also enable your customers to save $10 simply by purchasing from you during the event. Definitely a win-win!